Microsoft Windows XP Professional Upgrade in the box with CD and all the papers. Ready for you to use. We purchased this upgrade new for our laptop which we have now sold therefore we do not need the software any more. It is in near mint or better condition. Designed for businesses of all sizes and for home users who demand the most from their computing experience, Windows XP Professional delivers the new standard in reliability and performance. 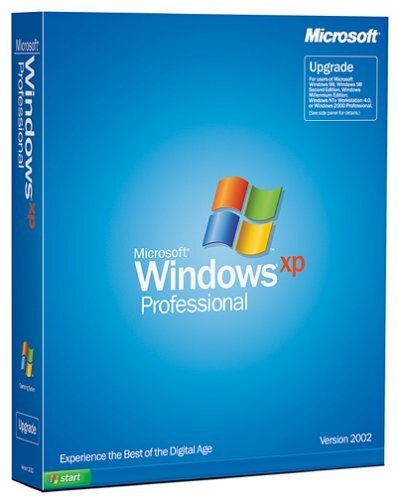 It includes all the great features and new visual design of Windows XP Home Edition, plus premier security and privacy features, advanced recovery options, improved ability to connect to large networks, and much more. Our box has a small bend in the upper right corner. Contents are in near mint or better condition. Microsoft Windows XP Professional Upgrade in the box with CD and all the papers. Windows Vista Ultimate with SP1 Upgrade is new in the factory not opened box.